Air-popped popcorn makes a quick, healthful, and inexpensive snack, while avoiding the excessive packaging and iffy ingredients of microwave popcorn. 1. It works fast, popping 1/3 cup of popcorn kernels in about 4 minutes. 2. It's easy to use. Measure the popping corn in the lid, pour it in, turn it on. 3. 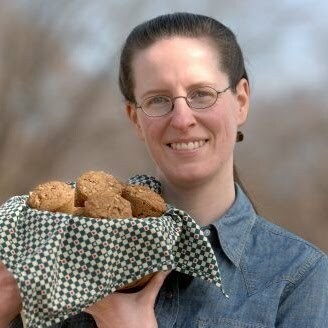 It's relatively efficient, using just 900 watts of energy to the Wearever Popcorn Pumper's 1250 watts. 4. It doesn't make a mess. All the popcorn stays in the bowl; no kernels fly around the kitchen. 5. Virtually no unpopped kernels. 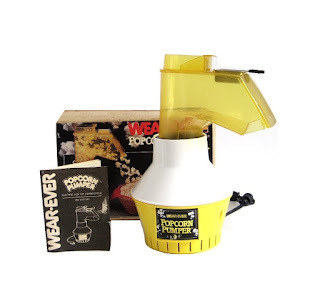 The Wearever Popcorn Pumper (and any other hot air corn popper with a spout) will eject unpopped kernels along with the popped ones (the force of the pops can send them sailing out), but the lid on the Handy Pop 'N' Serve keeps the kernels where they belong, giving each a chance to pop. There are always a few duds that won't pop, but all the kernels that can pop will pop. Handy Pop 'N' Serve made 9 cups of popcorn to the Wearever Popcorn Pumper's 8 cups, with the same amount of popcorn kernels. 6. The popcorn turns out just like popcorn should, and has a built-in butter melting cup if you like your popcorn buttered. 7. It stores compactly, because it's not as tall as the Popcorn Pumper. 8. It's so intuitive, a young child can use it (supervised, please!). 9. The popping chamber doubles as a serving bowl - no dirty dishes! 1. Durability. If you forget to remove the bowl from its base before putting salt in, the salt will get into the base and make the inner workings rust over time. If a kid uses the machine, this is bound to happen. 2. If you have a large family, it might not make as much as you want. 3. 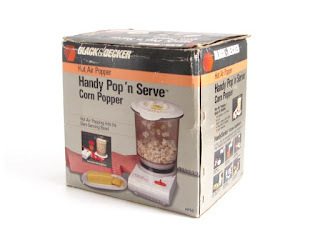 The Black and Decker Handy Pop 'N' Serve is from the late 1980s, and it's no longer produced (but you can find it here). 4. If you forget to turn it off when it's done popping, you could burn the popcorn. 2. It's easy to use. Measure the popping corn in the lid, pour it in, plug it in. 4. The popcorn turns out just like popcorn should, and has a built-in butter melting cup if you like your popcorn buttered. 5. Durability. These poppers are made in USA, and they last! 1. Unpopped kernels. The force of the popping corn often sends unpopped kernels flying out along with the popped kernels. 2. It takes more space than Handy Pop 'N' Serve; unless you have a tall cupboard, it will need to be stored in two sections (lid and base), and it's easy to lose the butter melting cup. 3. It makes a mess. If you don't put the bowl on top of something so the edge of the bowl is right under the spout, you'll find some popcorn on your floor and counter. 4. It takes about 1/3 more energy than the Handy Pop 'N' Serve. 5. From the late 1970s / early 1980s, the Wearever Popcorn Pumper is no longer produced (but you can find it here). My favorite popcorn popper is the Black & Decker Handy Pop 'N' Serve. If you're looking to save money on snacks or to make it easier to snack smart, the Handy Pop 'N' Serve will pay for itself quickly, because it's convenient enough to use frequently; in fact, it's no more difficult than microwave popcorn. apple quickly, with very little waste. 1. Durability - this peeler is around 100 years old, perhaps older, and it still works great. There are no plastic parts, and it's made of cast iron. Need I say more? 2. Speed - the auto-eject is not only fun and extremely satisfying, but it definitely speeds up the process. Once I got going with this thing (and you don't see it in this video, because it only shows the first few I did), I put apples on as I was cranking the blade back to the front, and it was SUPER fast. 3. It looks cool. This peeler has a lovely patina that only comes from years of use. Use it for decor when you're not peeling apples. 4. The blade is simpler, so it won't go out of adjustment as easily as the Pampered Chef peeler. 5. There's very little waste. 6. Peels a wide range of apple sizes. 7. It's extremely effective. This peeler leaves very little skin on the apple, just a bit at the stem end and the blossom end. 8. Because it doesn't core or slice, it doesn't spill as much juice around as the Pampered Chef. 1. The clamp doesn't open wide enough to fit on the edge of a standard kitchen counter; I had to mount it on a board and then clamp the board to my table. 2. It doesn't core or slice. 1. Durability: The Pampered Chef apple peeler is pretty nice quality - nothing like the Hudson peeler, of course, but it doesn't feel chintzy. 2. It cores and slices. 3. Versatility: It can peel without coring or slicing. It can core and slice without peeling (I forgot to show this feature in the video, but you can pull down the peeling arm and there's a little bar that holds it back if you don't want to peel). 4. Handles a wide range of apple sizes. 5. It's effective. It misses a little more skin than the Hudson, but it still does a good job. 6. The clamp opens nice and wide, and will fit most tables. 1. Waste: This peeler has more waste than the Hudson. You can adjust the blade, but, in my experience, it's hard to get it just right. Also, the core has all kinds of good apple left around it, and I core by hand quickly and with less waste. 2. Coring leaves pieces of the apple seed casing. No corer will core as well as you can do by hand. 3. It doesn't look nice. It's just a boring machine. 4. A countertop doesn't generally have a large enough lip for this to fit on, and it works its way loose pretty easily, especially if you use the rubber bumpers provided (I don't use them in this video). 5. It's a bit messy. The coring and slicing action leaves juice to run out of the apples, so you'll have a sticky mess to wipe up afterward. Both apple peelers work well and I recommend either. If slicing and coring isn't important to you, then you'll be very happy and impressed with the Hudson apple peeler. If you prefer a machine that cores and slices, a Pampered Chef peeler corer slicer will serve you well. and under-cabinet Black & Decker toaster oven. You could call it a botch job. Moving into our 1949 ranch, we found a new tile floor poorly installed, cheap plywood cupboard doors slapped up sometime after the house was built, and new hinges that didn't fit or work right. Neither retro nor modern, this kitchen needed help. We considered replacing the cupboard doors, but a router borrowed from a neighbor, a sander found curbside, and mistake paint from the local paint store's "bone yard" spiffed up the sad, sagging things. Porcelier teapot, vintage chrome toaster. Vintage hinges, knobs, and drawer pulls from a thrift store, estate sale, and Pitsch Wrecking - a local demolition firm that runs a gem of an architectural salvage shop - replaced newer ones that weren't nearly as well-made. It took a few years to assemble the hardware we needed (were I less patient, shopping Etsy would've found me what I wanted much sooner). It took a decade from the time we moved in for Calin, my husband, to remove the tiles on the floor (mostly due to my indecision). Because we strive to be a zero-waste family, we didn't want to use flooring that would need to be torn out and thrown away eventually, so we opted to sand and refinish the spruce subfloor. It turned out beautiful! We found the perfect counter-height oak table for our kitchen at City Antiques in Grand Rapids, Michigan, but it was for display, not for sale. We left our contact information with the clerk just in case, and a mere month later, we received a call saying we could buy it! Soon after, we scored a set of Amish-made oak and tree branch stools at a garage sale. Finds like these make treasure hunting fun! Arrowhead "Brookpark" melamine dishes, Mid-Century mismatched stainless flatware. A retro kitchen renovation can be both charming and cost-effective. In all, we spent under $500 to complete the project (not including the kayak I promised Calin if he completed the project by the new year), with the wallpaper and floor refinishing our biggest expenses. I'd love to increase the cost with the perfect retro stove, but if we wait long enough, our stove will be vintage, right? Vintage waffle irons come in a variety of appealing shapes and designs; unfortunately, so do the cords, which gets confusing. This post takes the mystery out of the types of vintage waffle iron cords, and will help you figure out what kind you need for your waffle iron, coffee percolator, or other vintage small appliance. Left to right: 11/16" spade type (it has oval holes), 11/16" prong type (round holes), 1/2" prong type (round holes). Note: There's also an uncommon cord with 1/2" space for flat spades; it's a very uncommon style and is not shown, but I do see them once in a while. Measuring is done from the center of one prong or spade to the center of the other. The cord ends are also measured center to center. This is the 1/2" cord. Because the holes are round, it only fits prongs that are round. It does not fit spades. I hope this helps. If you have other questions about small appliance cords, please ask! Googlewhacking. Enter two words into Google. If you get just one search result, congratulations! 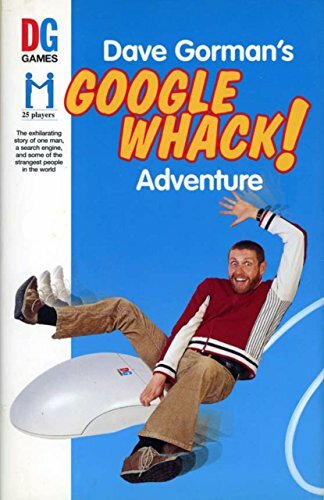 You've found a googlewhack! Dwindling habitat endangers animals; a growing worldwide web endangers googlewhacks. While finding a googlewhack represented a challenge 10 years ago, now they're nearly extinct. But, I'm working to save them. A funny little ladle by an undocumented company, at Laura's Last Ditch Vintage Kitchenwares. Researching this ladle, I couldn't find a single reference to the company that made it, a manufacturer by the Dr. Seuss-esque name of Smarp & Smith. So, for you googlewhackers - or anyone who likes hard-to-find vintage kitchenwares - Smarp & Smith! It existed, sometime, somewhere, creating nice, sturdy little ladles, and who knows what else? And perhaps I've created a googlewhack for the next person researching this forgotten company. I would be less surprised if something were headed to United Arab Emirates. I sell all over the world, but last night a sweet lady from my town contacted me to ask is she could see my silverware sets in person before deciding which to purchase. She's so close to me that she walked, which helped her avoid the extensive road construction our neighborhood is enjoying this summer. She brought along some pieces of her grandmother's silverware to see what sets would make a nice mix-and-match arrangement. She settled on an Art Deco set and a more traditional, understated set that would complement her pretty floral silverplate pattern. The walk home must've seemed longer than the walk here, since she left with two silverware sets and chests under her arm! She's so happy to be able to use her silverplate when entertaining a larger group and is delighted with the look. 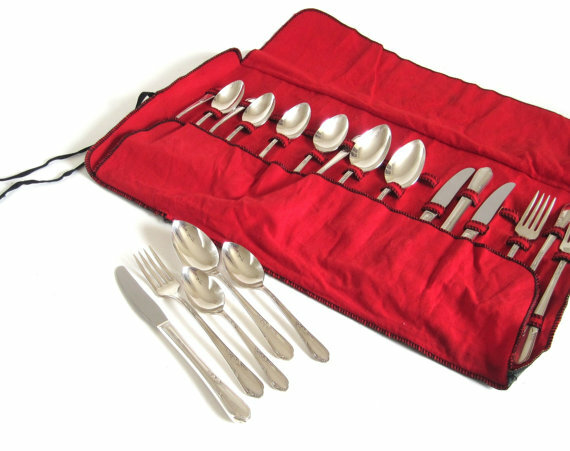 Don't be afraid to mix together multiple sets of silverware - it's just as lovely, and a lot more interesting! 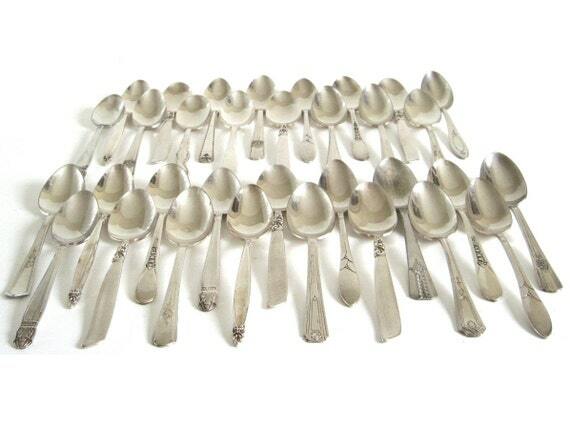 Mismatched silverplate teaspoon sets, $14.99 & up.